Patio Place offers Newport Beach residents and businesses the best selection of brand name patio furniture, bar stools, BBQ grills, gas logs, fire pits, awnings, umbrellas, and more, all for some of the best prices in Orange County. In business for more than 25 years, we have long-standing relationships with many of today's leading manufacturers, such as Alu-Mont, Hanamint, Galtech, Ratana, Sunset West, Telescope, NorthCape, Kings Rattan, and Fire Magic. We can negotiate the lowest prices on all kinds of off-season and closeout merchandise, and make it our mission to pass these savings on to our valued Newport Beach customers. In addition to our extensive selection and value pricing, our family-owned business prides itself on delivering superior customer service to those in Newport Beach. We specialize in cost-effective repairs, such as umbrella recovering, restringing, and rib replacement, and custom fabricating replacement cushions and slings. You can always count on us for honest, expert advice, friendly staff, and above-and-beyond service. For example, we not only offer convenient, same-day delivery for most of our inventory, but we also haul away your old patio furniture and equipment, clean up your outside space, and assemble and set up your new patio tables, outdoor sofa, bbq, or other outdoor accessories for you. And, if you're considering a large purchase, such as new patio furniture for an entire country club or restaurant, we will drive out to your Newport Beach location and discuss your specific decor, usage, and budget needs. We will even bring out fabric samples, catalogues, and prototypes that you can touch, sit on, and compare to your Newport Beach outdoor space. From bulk orders to custom-made patio furniture, we have the resources to meet all your outdoor needs. We know this because we've already helped thousands of customers across Orange County and the greater Newport Beach area, from a wide variety of homeowners to some of the most well-known businesses, including Newport Beach's Dave & Buster's (a restaurant and entertainment business), the American Legion Yacht Club, and the Park Newport Senior Community. To learn more, give us a call or visit us today at our showroom in Costa Mesa. Visit Patio Place today for the best deals on wicker, extruded aluminum, and cast aluminum patio furniture. Serving Newport Beach, we offer an incredible selection of discounted aluminum patio furniture, including dining chairs, deep seating, sectionals, lounge chairs, chaise lounges, loveseats, sofas, benches, bar stools, lounge beds, swings, ottomans, and more. Whether your Newport Beach outdoor space is large or small, commercial or residential, we'll make sure you get outdoor furniture that suits your space perfectly. 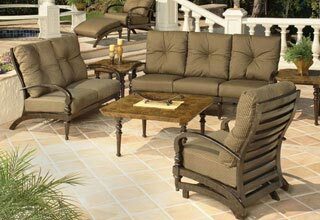 We sell and deliver outdoor furniture from the names you trust most, including Sunset West, Patio Renaissance, and more. 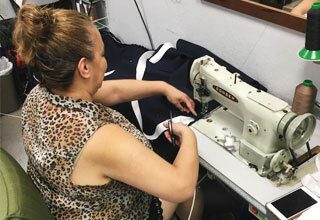 We can also revitalize existing patio furniture frames and custom fabricate replacement patio chair slings, outdoor pillows, and outdoor cushions. These custom slings, pillows, and cushions are made with top quality fabrics, such as those made by Sunbrella, Phifer, or original manufacturers. These fabrics are often warrantied for years against fading and damage. We sell and deliver brand name fire pits and bar stools at the best value in Orange County. Our extensive collection comes from the finest names in the industry, such as Hanamint, OW Lee, and Alumont. Newport Beach customers will find among our inventory: fire pits, bonfire pits, fire tables, granite fire pits, slate fire pits, marble fire pits, cast aluminum fire pits, and more. 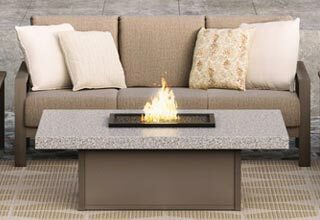 We also sell attractive fire pit accessories, such as domes, ceramic gas logs, and reflective fire glass, as well as a wide selection of bar stools and other patio seating options. Visit us today and learn more about our quality inventory of bar stools and fire pits for Newport Beach homes and businesses. Our low pricing, high-quality inventory, and excellent customer service make Patio Place Newport Beach's premier choice for patio umbrellas. We offer a broad collection of outdoor umbrellas from NorthCape, Treasure Garden, Galtech, and other trusted manufacturers. Our patio umbrellas are available in cantilever, auto tilt, push-to-tilt, side post, easy track, and other styles, and come in varying sizes and designs. 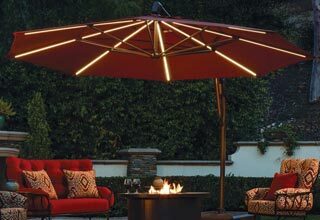 Our umbrellas can be further customized with our selection of umbrella accessories, such as lights, fabrics, and bases. As a family owned business, we take pride in what we do and welcome any and all questions. Learn more today. Newport Beach homeowners and business owners can turn to Patio Place when they need superior quality barbecues and gas logs at a great price. We can also order top-of-the-line barbecues and portable grills from Fire Magic, a leading manufacture of top-quality barbecues, as well as the market's finest gas logs from R. H. Peterson, at your request. In business for over 25 years, we can answer all your questions and help you find the perfect barbecue grill or gas log for your needs and budget. We'll even arrange for same-day delivery to your Newport Beach home or business. We welcome the chance to exceed your expectations, so call or visit us today. At Patio Place, we invite you to come see our extensive selection of brand name patio furniture, barbeques, gas logs, fire pits, bar stools, umbrellas, and more, on display at our conveniently located showroom located at 845 Baker St., Costa Mesa, CA (between Bristol and Bear). We are always happy to provide our Newport Beach customers with whatever information they may need, so call or visit us today.